Fall is in the air this week, with cool weather to release the hidden colors of tree leaves and gusty winds to swirl them all over the neighborhood. Farmers' Markets have already transitioned into this new season, offering late harvest produce, tempting me with multi-hued piles of crisp peppers and chilies, mounds of sturdy greens and oh! so many varieties of apples. Apples! just the thing to use for the September #TwelveLoaves project. #TwelveLoaves is a monthly bread baking party created by Lora from Cake Duchess. #TwelveLoaves runs so smoothly thanks to the help of the lovely Paula from Vintage Kitchen Notes and Renee from Magnolia Days. Our September baking mission is about baking bread with something sweet or savory you find at the Farmers Market. 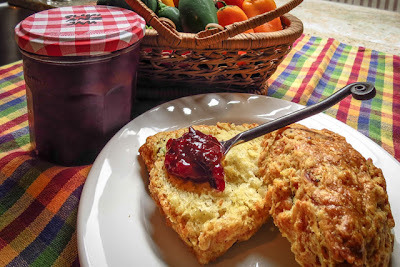 Share your September Farmers Market Bread (yeast or quick bread). Let's get baking! I delayed this month, considering one apple recipe after another, but never did commit to baking any of them. With the month ending soon, procrastination had to stop. Right now. Immediately. Today. 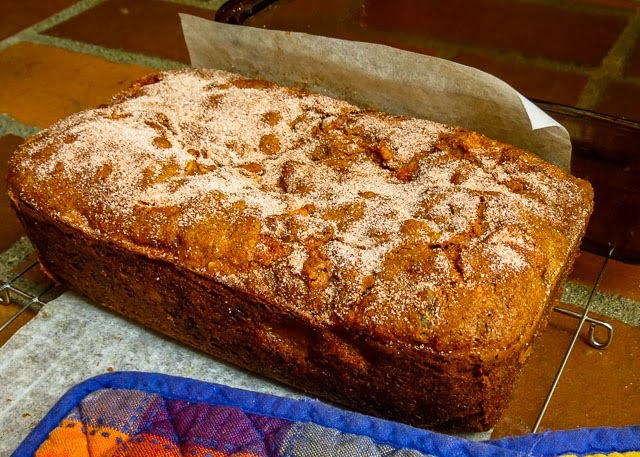 I woke early, well before dawn, and decided to play with a Spiced Apple Bread recipe I had found online at about.com SouthernFood. I halved the recipe, tweaked the ingredients a bit, and wished I had baked this delight weeks ago. The flavor was amazing, in a good way. 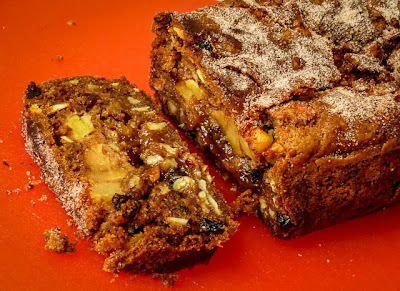 Think apple pie hiding in a cakelike loaf that is called a quick bread. Right. The recipe came together easily enough and the house smelled divine as it baked. I sipped a morning brew and waited impatiently for it to finish baking and then cool. It looked so tempting when it came out of the oven. Drat! My loaf was not so pretty after it cooled a while on the wire baking rack. Like a sway-backed old nag, it sagged in the middle. Oops, it should have baked a bit longer. No matter, we still enjoyed half a loaf for breakfast, despite the issue with a too-moist center. Next time I will use smaller bread pans or muffin tins, adjust the baking time as needed, and be more attentive when I poke it with a tester. There definitely will be a next time, maybe even tomorrow. 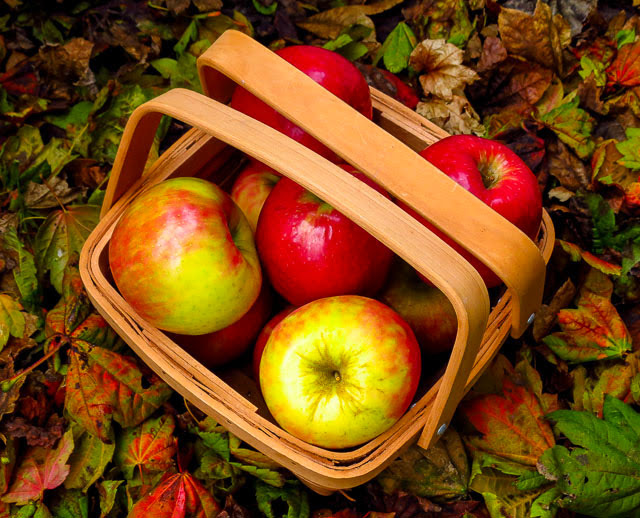 Fresh Apple Quick Bread is our new favorite Fall treat. It's terrific as a warm breakfast slice, or even crisped up under the broiler. Top a thick slice with a dollop of mascarpone or Greek yogurt with honey for a tasty dessert or snack. Bake in mini bundt pans, then drizzle with a loose powdered sugar frosting for an attractive presentation. Yum. Use cooking spray to coat a 9x5-inch loaf pan. Cover the two long sides and bottom of the pan with a strip of parchment paper (to help with pan release and lifting out). Spray the parchment paper. Use a small bowl and combine the flour, salt, baking soda and spices. In a larger mixing bowl combine the sugar and oil. Beat in the eggs, vanilla and almond extract until well blended. 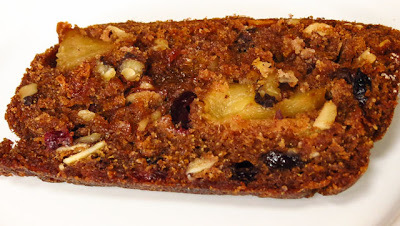 Stir in the apple chunks, raisins, cranberries, chopped nuts and lemon zest. Add the dry ingredients and use a large spoon to mix until the flour is thoroughly incorporated. Pour the batter into the pan and smooth the top with a rubber spatula. Place in the preheated 325 F oven and bake for 20 minutes. Slide out the oven rack and sprinkle the mixed sugar and cinnamon topping mixture over the top of the loaf. Bake for an additional 45 to 60 minutes, or as long as it takes for a cake tester to come out clean. Remove to a baking rack to rest before removing from the loaf pan. Let the loaf cool before slicing... if you can wait that long. Sourdough pancakes or waffles with a twist are the current challenge at Sourdough Surprises, the monthly baking group that uses sourdough for so many things besides bread. I can hardly wait to check out the creativity and interesting results from the other enthusiastic sourdough bakers this month. I considered several ideas for sweet sourdough versions. Some added chocolate or maple syrup to the batter, others played with the spices and flavors of carrot cake or chocolate zucchini bread, but I couldn't commit. I'll pursue them on another day, but this week I really wanted a savory treat, a non-breakfast pancakey something. BLINI... of course! 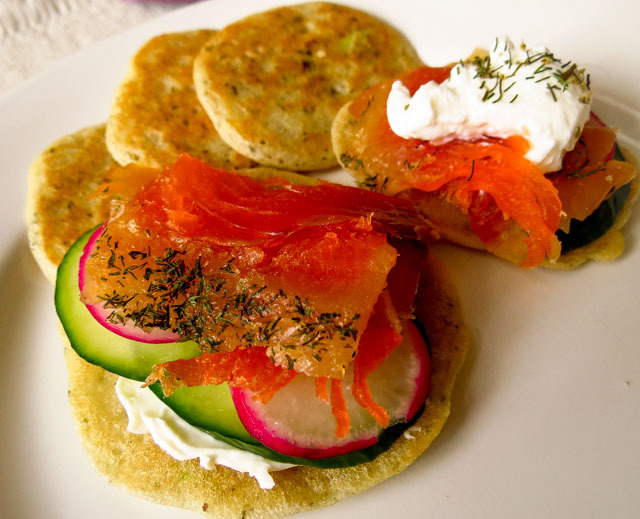 Four slabs of lox sat in the freezer, left from one of this summer's coho catch (link), a perfect choice to pair with these tiny dilled pancakes. Blini are often made with buckwheat, but I didn't have any in the pantry and worked with my usual AP flour sourdough starter. Once fed and rested (the starter, not me), the sourdough was ready for its savory twist. I added chopped green onions, minced capers, white pepper and a dill seasoning mix to my standard batter... minus the sugar, of course. It wasn't pretty, but it had great flavor potential. The fun began once the griddle was hot. Half a dozen quarter-sized blini were first to come off the grill, followed by ever larger pancakes until two saucer-sized giants finished the last of the batter. We I couldn't wait and nibbled a few plain, hot off the griddle, justifying it as taste-testing for flavor adjustment. Mmmmmm, delicious as is. No changes required. The seasonings were balanced nicely, with no one flavor dominating. 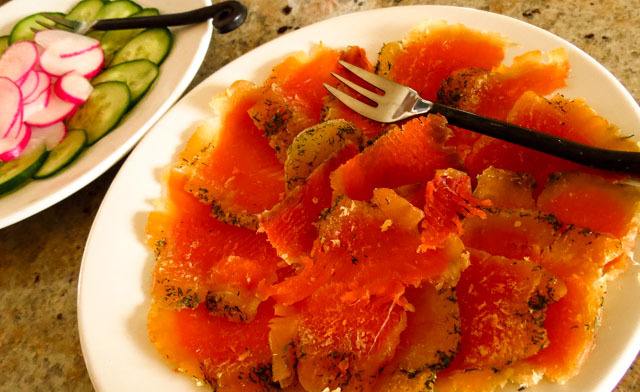 I chose to serve them at room temperature, layered with thin slices of cucumber, radish and a pile of lox. 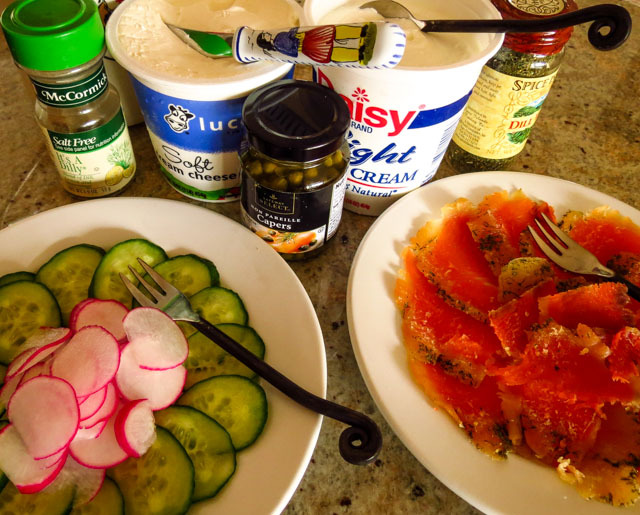 Bagels and lox are known to pair nicely with cream cheese, and blini, lox and cream cheese are a good match too. But... the combination seemed a bit heavy. Then we tried some with sour cream - YES! 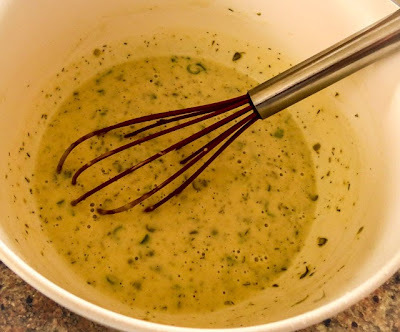 The tangy sour cream plus a light sprinkling of dill weed created a lighter, fresher bite. These little cuties will soon be were an excellent menu choice for a light lunch, brunch, or Happy Hour appetizer. The two saucer-sized pancakes became lunch bites to share, except I ate them both. One was a peppy poblano and cheese stuffed quesadilla, and the other a cool and mellow cream cheese, avocado and sprouts wrap similar to a crepe. Delicioso! 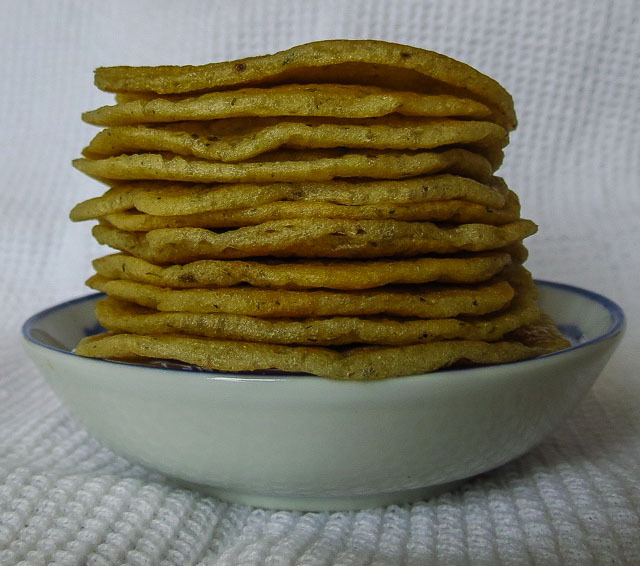 Update: The stack of blini shown below turned into 5 cheese-filled quesadilla mini bites the following day, perfect to accompany a bowl of avgolemno soup. Just a quick grill in an ungreased, non-stick skillet and they were ready, crispy outside and creamy inside like mini tortillas. I love these versatile little pancakes. The same batter will also make terrific waffles, perfect to accompany a bowl of fish soup or salmon chowder. You really need to try some savory sourdough pancakes. Really. And now I'm ready to play with one or two of those sweet sourdough variations I passed up earlier. Add the dissolved soda at the last minute, when ready for the batter to hit the griddle, folding it gently into sourdough. Do not beat heavily. The sourdough will lighten and fill with bubbles, increasing its bulk. Bake on hot griddle, turning once as bubbles form and sides brown (Use 1 to 2 teaspoons of batter for a silver-dollar sized blini. Adjust accordingly for desired size.) Cook to a golden brown color. Serve immediately or transfer to a baking rack to cool (or to hold in a warm oven). This will keep the blini from getting soggy bottoms. Spicy Italian could refer to some people I know, but hey!, I'm thinking jam here. It began with Monday's unplanned purchase of a box of nearly ripe Italian Prune Plums. This stone fruit is a handy snack all by itself, and it is a good addition to a breakfast smoothie, but a whole box?! What was I thinking? Hot weather and a warm kitchen brought every one of these treasures to ripe, ready-to-eat status by Tuesday. Now what? Freeze them? maybe. Make coffee cake or bake in a crust for dessert? Nope, too hot to turn on the oven. Quick chutney or jam? Oh, yes please. 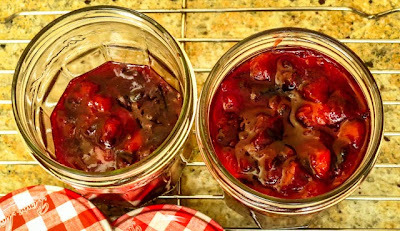 A gazillion versions of Plum Jam appeared all over the blogosphere this month, many with similar techniques and only slight variations in flavor. Quick jam is all about threes. Three ingredients: fresh fruit, sugar and a flavoring. Three steps: macerate to extract the juices, cook down the liquids, ladle into jars. Ready to experiment with several batches ranging from A to V, Anise to balsamic Vinegar. I began with 3 dried pods of star anise. Good choice! 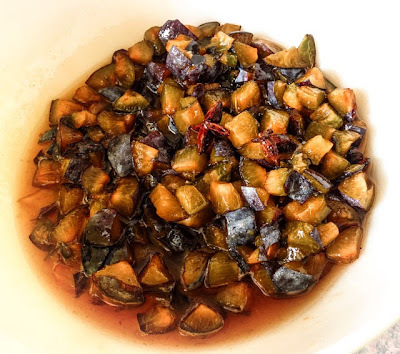 The licoricelike flavor of anise held its own as a subtle backnote against the not-overly-sweetened presence of Italian Plums. We spread the jam on toast, on crackers, on jalapeno cheese scones. We paired it with Manchego cheese, feta and white cheddar. We plopped it on top of Asian fish cakes and grilled black cod. 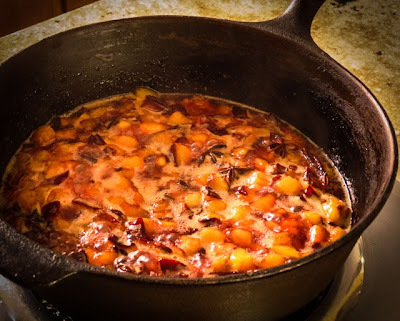 We added some to broiled peach halves... and we sampled more than I care to admit from a spoon. Yum to all the choices. Today a second batch of jam incorporated 3 quarter-sized coins of fresh ginger in addition to the dried star anise. Ginger can be a potent ingredient, but not here. Three pieces of ginger didn't begin to impact the flavor. 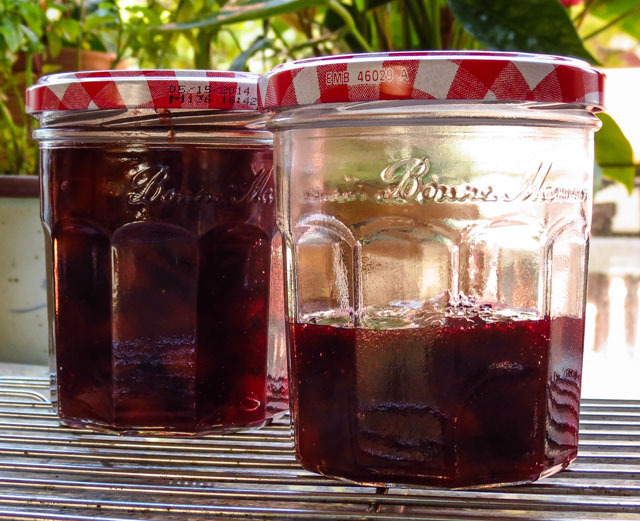 Not a problem, I just ended up with 1 1/2 more jars of tasty Plum Jam with Star Anise. Now the big decision is whether to make yet another batch flavored with star anise, or move on to another spicy choice? We might need another box of Italian Prune Plums while they are still in season. There are a still lot of tempting flavors to play with. inspired by several online recipes, and canning tips from Marisa at FoodinJars. 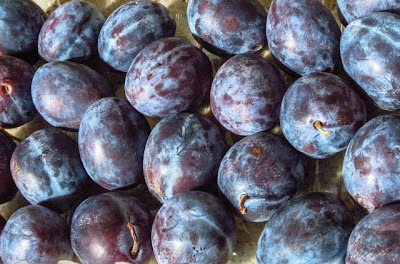 Wash the Italian plums, chop into small, roughly 1/2-inch pieces, discarding the seeds. Place in a medium mixing bowl, sprinkle with the sugar and stir to mix. Add the anise (&/or other spices) and mix again . Let stand for at least one hour to pull out the juices which blend with the sugar and form a syrup (macerate). Transfer all to a wide pan with sides high enough to contain the bubbles and splash when the mixture comes to a boil. Bring to a boil over high heat, then reduce to a steady, less energetic boil. Cook for 10 to 15 minutes after reaching the boiling point; stir frequently to prevent sticking and burning. (Caramelized sugar is tasty, burnt sugar is not!) Jam sets around 220 F, so use your candy thermometer and check it out as you go. No candy thermometer? then use the frozen plate test: drop a small dab of jam onto a small plate pulled from the freezer; wait a minute or two; if a surface skin begins to form, it's ready. 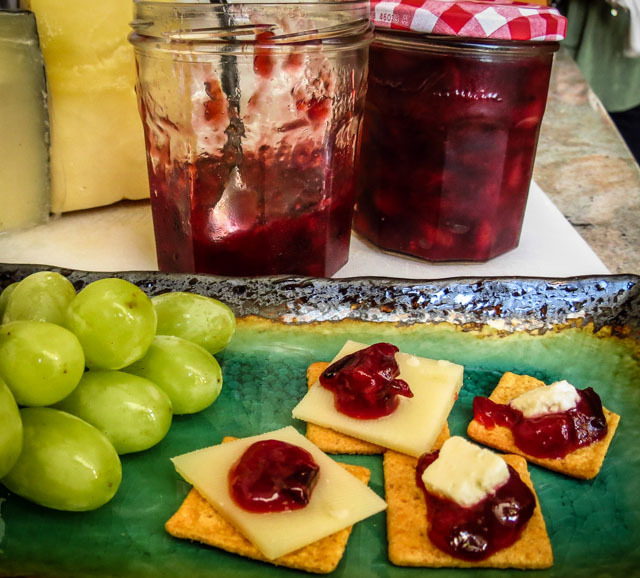 If the jam is more like a runny sauce than a spreadable jam, cook it for another minute or two longer. Remove and discard the anise (or any other solid seasonings). Pour into jars and move to a baking rack to cool. Add lids and pop into the fridge to hold... or you could finish by processing in a water bath to seal with canning lids. My first batch produced enough jam to fill one and a half jars. We will definitely finish it all within the week so I didn't bother to process one small jar to hold in the pantry. As I experiment with different spices and flavorings, I'll probably begin to process small batches to hold for ourselves and to set aside as gifts. 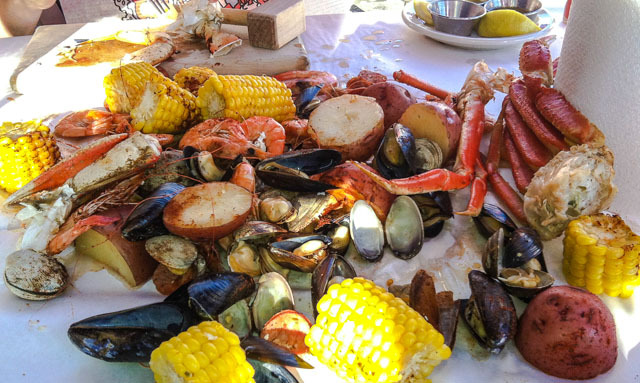 The top photo shows just one side of our table covered with cooked fresh seafood. This was two servings of The Westport Seafeast, featured at the Crab Pot Restaurant, Pier 57 on Seattle's downtown waterfront. Now picture an additional serving piled alongside, plus an accompanying round of sourdough bread and butter. That was a lot of food for three of us! 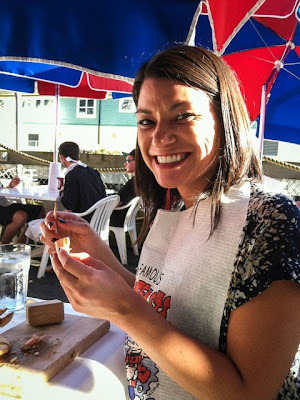 What's in the Westport Seafeast? 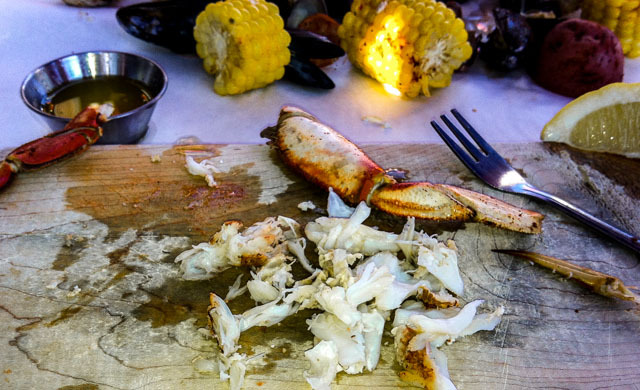 Dungeness crab, snow crab, whole shrimp in the shell, steamed clams, steamed Pacific mussels, thin coins of andouille sausage, chunks of corn on the cob, halved red potatoes in their jackets... and don't forget that loaf of sourdough bread. 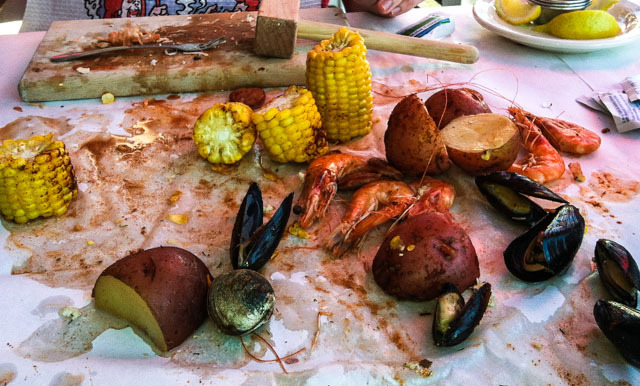 The seafood was dusted with spices and steamed, then dumped out on our butcher-paper covered table. A casual feast, it was meant to be attacked with wooden mallet, fork and fingers. 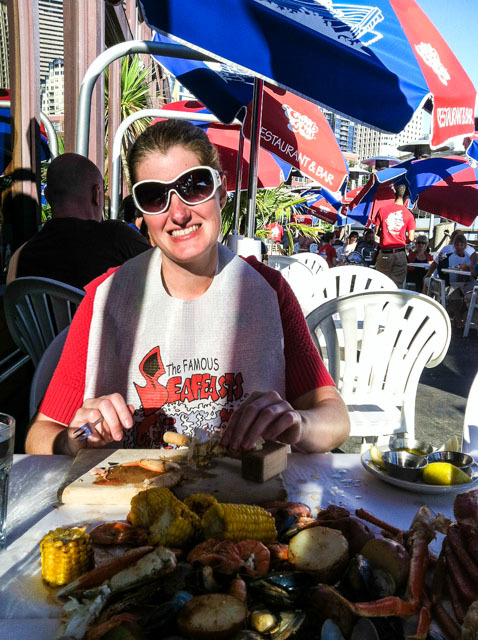 The mallet came in handy for cracking the crab legs, and made plastic bibs a dining necessity. Messy? of course it was messy, but it was also finger-licking good and fun to eat. We attacked the challenge with enthusiasm, focusing first on the seafood while it was still warm. Pause, breathe, ready for more. The andouille was mildly seasoned but had good flavor and I enjoyed half a dozen pieces. Pause, breathe, ready for more. The corn was tender and I nibbled on two chunks. Pause, breathe, no way, not ready for more. I could not find room for even one chunk of potato. You know the portions were generous when a handful of shrimp still remained at the end of the meal! Hilary and Laci hosted tonight's feast and I loved every bit of the event. What's not to love about a fun location on a warm summer evening, outside dining with a playful presentation, assorted fresh seafood, and entertaining dinner company? A huge, heartfelt "thank you!" to Laci and Hilary for my delicious and memorable birthday treat. 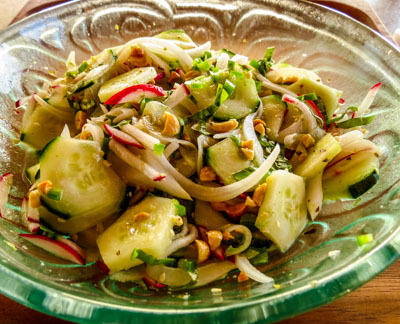 Here's another fresh, sprightly cucumber salad to carry us through the end of summer and into fall. It has more flavor punch than the typically milder suomono, and with a bit of seafood added could transition into a main dish salad. The vinaigrette is amazing, punchy enough to elevate those ordinary cucumber and radishes to star status. We enjoy this salad as a simple side, but I plan to pair it with grilled meats, pile it on a sausage filled bun or even use it to top a fish taco as the warm weather continues. Can you tell, I really like this new, flavorful cucumber salad? It was inspired by a recipe posted a year ago on Food52 by a cook who credited Deborah Madison for his inspiration. Hey, this salad has history... of a sort. Add the cucumber slices, onion, radishes, and pepper to a large bowl, toss gently to mix. Use a small bowl and whisk together the garlic, ginger, lime zest and juice, rice vinegar, fish sauce, sesame oil, and mirin. Drizzle the mix over the vegetables and toss until thoroughly mixed. Refrigerate for 30 minutes, allowing the flavors to deepen. Sprinkle with the sesame seeds, peanuts, and herbs and toss again before serving. Top with seafood, if desired, to make this a main dish salad.